Abstract: Laboratory research shows that when people believe that willpower is an abundant (rather than highly limited) resource they exhibit better self-control after demanding tasks. However, some have questioned whether this “nonlimited” theory leads to squandering of resources and worse outcomes in everyday life when demands on self-regulation are high. To examine this, we conducted a longitudinal study, assessing students’ theories about willpower and tracking their self-regulation and their academic performance. As hypothesized, a “nonlimited” theory predicted better self-regulation (better time management and less procrastination, unhealthy eating, and impulsive spending) for students who faced high self-regulatory demands. Moreover, among students taking a heavy course load, those with a nonlimited theory earned higher grades, which was mediated by less procrastination. 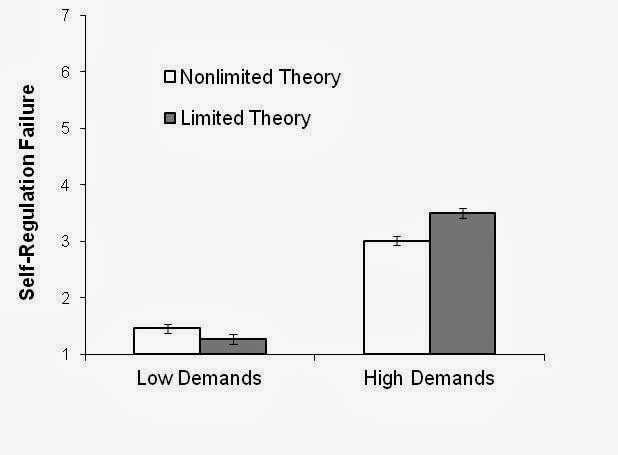 These findings contradict the idea that a limited theory helps people allocate their resources more effectively; instead, it is people with the nonlimited theory who self-regulate well in the face of high demands.